The San Francisco Umbrella Company is committed to selling unique, quality umbrellas that won't wilt in the rain like a salt log. You may use their umbrellas as a walking stick and they are made with only the highest quality materials. The ribs are fiberglass, in fact. The polyester is 190 thread count Pongee with a waterproof coating. 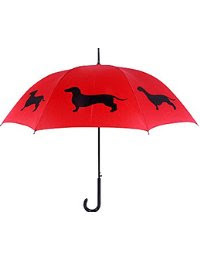 We were drawn to the San Francisco Umbrella Company because of all of the animals. They have tons of dog breeds. They also have cats, dolphins, an owl, a giraffe, etc. We are entranced and it's not like the rain isn't going to come. It is. We will be ready and we will be holding our new SF Umbrella. It's one of the cutest available products. Please, don't wave though. We don't want to use the wrong hand to wave back and drop our new weather gear. We get confused sometimes.